Most precious metals climbed Tuesday. In highlights, gold finished near a 21-week high, silver closed at a 1-month high, and palladium scored another record. Gold for February delivery advanced $7, or 0.6%, to settle at $1,246.60 an ounce on the Comex division of the New York Mercantile Exchange. The settlement was the best since gold ended at the same price on July 12. "The safe-haven metals are getting buying support from a big sell-off in the U.S. stock market today," Jim Wyckoff, a senior analyst at Kitco Metals Inc., said in a report. "The gold market is also benefiting from an improved near-term chart posture that is inviting technical buyers." 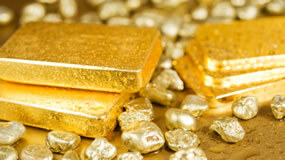 Gold futures ranged from a low of $1,235.80 to a high of $1,247.50. They rose 1.1% on Monday. Silver for March delivery gained 14.1 cents, or 1%, to settle at $14.64 an ounce. The finish was the highest since silver ended at $14.647 an ounce on Nov. 5. Silver futures traded between $14.46 and $14.75. They jumped 2% on Monday. January platinum declined $6.50, or 0.8%, to $804.20 an ounce, ranging from $799.60 to $811.20. Palladium for March delivery added $14.60, or 1.3%, to $1,180.20 an ounce — a fresh record. Palladium traded between $1,155.50 and $1,189.50. Gold rose $10, or 0.8%, to 1,240.30 an ounce. Silver added 16 cents, or 1.1%, to $14.545 an ounce.